Our Luxury Home Builders Can Create Your Dream Home in Mooresville or Lake Norman, NC. Custom cabinetry in your kitchen. Custom cabinets that utilize all the space in your kitchen are essential for a kitchen that is not only functional, but spacious enough to hold all your small appliances. In addition, walk-in pantries are great additions to neatly put away everything from foodstuffs to other essential home items. Added bathrooms. There is no such a thing as too many bathrooms! Ideally, you will want a bathroom for every bedroom — even better if they’re ensuite! Consider features such as heated towel racks, in-floor heating, soaker or jet spa bathtubs, and enclosed showers with luxurious rainfall showerheads. Energy-efficient green features. Even if you’re building a luxury home, that doesn’t mean you can’t be environmentally conscious! Incorporating skylights for added natural light; energy efficient windows, doors, and appliances; and even solar panels will allow you to save on energy costs and lessen your impact on the environment. Swimming pool. If you really want to take the plunge, consider installing an indoor swimming pool. From a small lap pool to a larger sized plunge pool, indoor swimming pools are the ultimate in luxury homes all year round! If you are looking for luxury home builders in Lake Norman, North Carolina, call us at Chad Goodin Signature Homes. 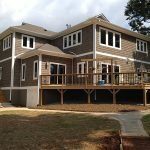 We have been building luxury homes in Lake Norman and Mooresville for 30 years and pride ourselves on excellent home renovations and remodeling services. If you want your dream home to become a reality, contact us for a consultation today and let’s make that dream come true! At Chad Goodin Signature Homes, our luxury home builders proudly serve Mooresville, Cornelius, Davidson, Huntersville and the surrounding Lake Norman area of North Carolina.